Our 2017/18 Sublimated Curling Apparel Early Bird Booking Offer is here. We have some exciting new designs and apparel styles for the upcoming season. Don’t forget, we also offer Custom Brush Wraps in the program, match your brushes with your custom apparel! Book early and save, see details below. 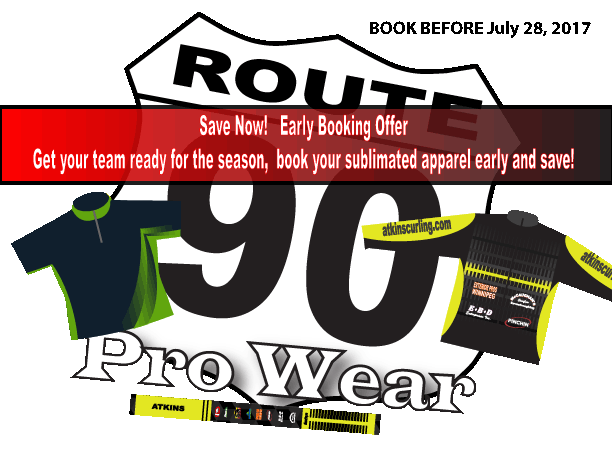 Special Early Bird Booking Offer on Route 90 Sublimated Pro Apparel. For orders received prior to July 28th, 2017. $219.95* per playerPackage includes 1 custom sublimated team jacket, and 2 custom sublimated short sleeve performance shirts for each player. * set-up fee, sponsor artwork fees (if necessary), and taxes extra. Deposit must be received prior to the July 28nd deadline to qualify for the package savings.Click on the image to view our new designs for 2017-18. Pick the design your team likes, 50+ designs to choose from. View our Route 90 Product Information Page for details.